Henry James "Hank" Monk was born in Waddington, New York. He always had a great fancy for horses and begun riding at a very young age. He once drove eight horses abreast in Boston during a civic celebration. 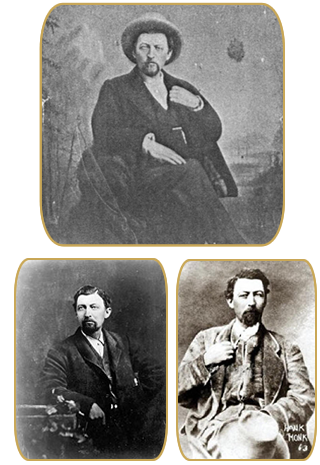 After coming to California in 1852 he began to drive between Sacramento and Auburn for the California Stage Company and later between Sacramento and Placerville. Hank Monk was a frequent visitor of the Historic Cary House. He is most famously known for driving Horace Greeley to the Cary House from Carson City, thats 110 miles, in 10 hours so Greeley could make his speech from the balcony on time. Mark Twain narrates an exaggerated version of the event in “Roughing It”. Besides nicknames "Knight of the Lash" and "King of the Coachman," he was also known as one of the most famous Jehus. The term Jehu is derived from the Old Testament, Kings 9:20 "...and the driving is like the driving of Jehu the son of Nimshi; for he driveth furiously." He died of pneumonia in Carson City and W.M. Cary, founder of the Historic Cary House Hotel, was listed as one of his pallbearers.